It wasn’t that long ago a number of the MusicPlayers.com editors were discussing the lack of a “complete” MIDI controller keyboard on the market today. Sure, it seems like there are hundreds of controllers available, and a few of them appear to be very nice, but they all seem to have an emphasis on either portability or working with computer-based hosts. In general, though, nearly all of them are “dumb” controllers that lack on-board memory for storing presets, relying on your host computer software to store and arrange your sounds/splits/layers/etc. But what if you have a lot of hardware synth modules you have collected over the years? What if you want to integrate the new and the old into one live setup? Manufacturers seem to have completely forgotten or abandoned musicians in possession of thousands of sound modules and hardware synths. The market is so lacking that one of our editors went so far as to purchase a 15-year old Roland MIDI controller because its feature set, in certain ways, was better than the current products! Annnnnnd… then along came the Physis line of controllers from Italian manufacturer, Viscount (yes, that Viscount, makers of the poorly understood yet awesome Oberheim/Viscount OB•12 synth). When we heard about the feature set on tap, we were blown away. And when we received our review unit and finally got a chance to put it through its paces, our anticipation was rewarded with one of the finest keyboard controllers ever conceived. Featuring eight (really) MIDI outputs, a color LCD screen, four USB ports, nine sliders, eight MIDI zones, a great feeling keyboard—and that’s just for starters, what’s not to love? We received the EX version, which adds a variety of internal sounds ranging from acoustic instruments to electro-mechanicals to synth sounds. And while the internal sounds may not replace a dedicated stage piano or premium analog poly synth, most of the sounds are good, making this keyboard a potential one-keyboard-at-the-gig kind of device should you find yourself not wanting to control your rack full of sonic bliss. Given the hefty feature set—and unfortunately, hefty price—this is certainly not in competition with today’s typical MIDI controller. But then, it’s really in a league of its own. As a pro-level MIDI controller that can do it all (and then some if you throw in the EX sound option), you’d be hard pressed to find something better. As you can see, the Physis is packed! And, since we had the EX version, it includes an internal sound card providing sounds, making this as much an instrument as it is a MIDI controller. Interestingly, the sound card uses physical modeling (as opposed to samples), and it has acoustic pianos, electro-mechanical pianos, harpsichords, mallets, and synths (High Definition Sound Engine). A nice touch is that when any of the sliders on the Physis are moved, the LCD changes to show you what you are controlling, and reflects the change in real time. Once you stop touching, after a second or two the screen automatically goes back to whatever screen you were on, a great time saver that eliminates button presses and keeps your hands in the performance. With the Physis EX version, there is a magnetic strip you can lay across the slider section which provides additional labels related to sound. The default labels on the metal case are Knob 1, Slider 2, etc., whereas the magnetic strip provides additional labels such as Effects, Pan, and the like. The labels are also displayed on the LCD display once you start fiddling with buttons/sliders/knobs. Another nice touch is that the buttons have LED lights in them, so if a control is active, the light is blue; if off the light is red; if not used/unassigned, there’s no light at all. After the sliders come a set of four bank selection buttons (for choosing presets), also with an LED to show which is active, and below that are a whopping eight Zone buttons for assignments of splits and layers. On the fly you can turn on/off your zones, and there’s an additional button below labeled View, which allows the LCD to display the detail of the zone button you have activated or all of them at once. Of note, when you press this button while holding the Shift button, this puts you in Standby mode, reducing energy consumption and not erasing any unsaved changes, which turning the power off would. In the center is the graphic LCD screen. It’s not touch sensitive, nor is it as huge as some of the newer synth workstations, but it is clear, colorful, and definitely a huge upgrade over any two-line (or none) LCD panel as found on many controllers. At nearly five inches and with a 480x272 pixel resolution, we had no issues with it and thought it was great to have so much information easily available. Below the LCD screen are four useful buttons, labeled Scene (A through D). In Performance mode, each of these buttons represent a variation of the main page/sound you are on. For example, when we were on a brass synth patch, one of the buttons was labeled “OB HORNS” and another scene was labeled “Jump”. Though based on the main sound, these scenes allow further variations to be instantly available on the fly. To the right of the screen are the Data Entry, Keypad, and cursor sections, allowing you to navigate the presets, LCD pages, etc. Pretty standard navigational stuff. There’s also a useful transpose button in this area too. Transposition is in semitones, and you have to hold the button down while turning the encoder knob to get the value desired, or you can push the Transpose button and use the Inc/Dec buttons. This can be done with three fingers on the same hand thanks to their close positioning—a subtle but nice detail. Of note, some of these buttons serve dual functions when pressing the shift key. One nice touch is a “panic” button that mutes all MIDI if things freeze up or, to quote the manual, for when things get “out of control.” If only people came equipped with such buttons! The sequencer control section is neither that nor an arpeggiator (though that would have been pretty awesome), but rather it is a transport control section for use with a DAW or any other MIDI device you may need to start/stop, etc. The 88 keys are weighted and have aftertouch, and it’s noteworthy that even the 76-key version, the Physis K5 and K5EX features fully-weighted keys. When used with the optional PD3 pedal, you get unlimited pedal expression for sustain, sostenuto, and soft, perfect for controlling piano sounds with unparalleled nuance. At 43 pounds, the Physis K4EX is a solid piece of gear, but completely in line with the weight of other pro keyboards featuring premium weighted keyboards. One look at the rear panel and you know this controller was meant for players with a lot of gear. Here there are eight MIDI Outs, two MIDI Ins, four USB ports (to connect directly to other devices), one additional USB port to go to your computer, eight pedal inputs which all support continuous and switch controllers, L/R audio outputs (if you have the EX sound card), and a headphone jack. For those of us with sound modules and other outboard gear, what a great way to tie it all together, without an external MIDI patch bay. Unlike the pro-level MIDI controller keyboards of days gone by, the Physis doesn’t require you to remember which sound module or synth is connected to which interface port by number: it lets you enter actual product names into the system and then select devices by name. It goes even further, letting you save patch/preset names from your sound sources in tables for easy access. There’s much more to say about this in the Usability section. You can arrange performances in set lists, called Chains. 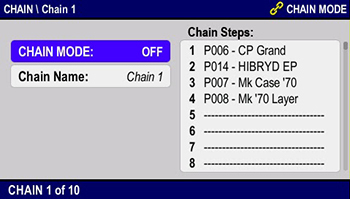 In Chain mode, you arrange your (named) performances in the desired sequence. The Physis stores up to ten chains, and each chain has up to 128 steps. Let’s start with the basic architecture first. 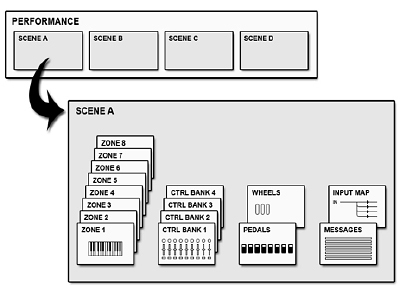 A Performance contains four Scenes, and is a way to group and recall Scenes quickly. Only one Scene can be active for each Performance. Scenes (SCENE A-B-C-D) can be selected by pressing the function buttons [F1], [F2], [F3] and [F4] from the main video page. A maximum of 128 Performance can be created. Performance can be saved to the internal memory or to a USB stick, and reloaded when needed. You can therefore create an unlimited library of Performances. Some may view a Performance as a song for live playing, and the Scenes within the performance represent the different sections of the song. Scenes determine the functioning of all the components of the instrument, such as keyboard, knobs, and all controls. A Zone is a portion of the keyboard. It can have any range from one key to the whole keyboard. 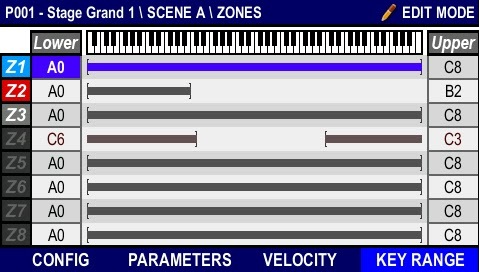 For each Zone, the following parameters can be set: output port, MIDI channel, Program, Bank select, volume, pan, reverb, chorus, transposition, aftertouch, velocity, and keyboard range. The Physis can manage a maximum of eight Zones at the same time. These Zones can control external MIDI devices through the MIDI and USB ports, or the internal sound board in the Physis EX (in models K4-EX/K5-EX). Therefore, a maximum of eight different devices can be played at the same time, and distributed across the keyboard. “Each Zone can be assigned an output MIDI port, through which MIDI data is sent to external devices. 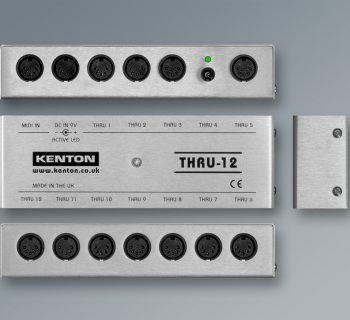 In K4/K5 these ports are MIDI OUT, USB [DEVICE], [HOST 1-2] and [HOST 3-4] connectors. 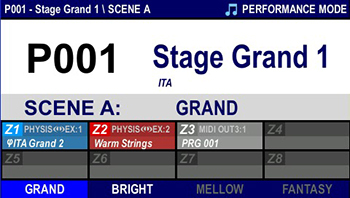 When programming a Zone, when selecting a MIDI output, the display shows the name of the connector, though not that of the instrument, since it cannot be known. To overcome this problem, K4/K5 has a set of tables, called Virtual Instruments, that associate each MIDI connector to an external device. 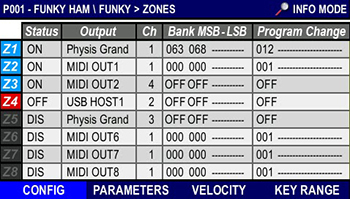 Thanks to these tables, when programming a Zone it is not necessary to remember the MIDI connector, but only the device. Furthermore, the names of available sounds, programs and controls for a certain device can be defined by the user. This means that the user does not need to use the code of a Program Change, or the type and code of MIDI message assigned to a control or parameter. So… let’s try to put this into real world terms. We connected the Physis via MIDI to our trusty Roland XV-3080 synth module, and even without any setup, playing notes on the Physis triggered the module—no surprise there. Turning the program change knob on the Physis correspondingly changed the preset on the module within the current sound bank, also no surprise. Where the Physis really shined was when we set it up properly, to play the XV-3080 as a virtual instrument. To do this, we pressed the System Mode button and pulled up the menu to enter an external device name. Using the keypad in smartphone-esqe style, we entered the name “XV-3080.” We saved it, and that was all there was to it. Ideally, there would be a way to use a full sized keyboard (the Korg Kronos, for example, lets you connect a USB keyboard to facilitate entering data), to make a fast chore of entering our patch names into the onboard memory. Viscount has a small library pre-populated with patch names from a selection of keyboards from Alesis, E-MU, Korg, Roland, and Yamaha as a starting point, and we hope to see this grow over time, either from Viscount or through the growth of an online user community. Next, we picked a blank Performance, and then started programming the first Scene (Scene A). As described previously, once you are editing Scene A (i.e., press the dedicated Edit button! ), you get to the Zone page. It is here where you can select your input, and in our case we then picked the XV-3080 by name. 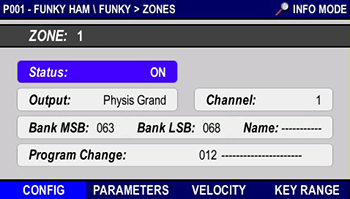 Once we had our instrument selected, the same menu page had the MSB/LSB/Preset columns to set up. For our XV-3080, we entered 87/66/54 for those three values, to generate the selection of preset 54 in bank PR-C of the XV-3080 (we didn’t pull those values out of thin air—they are documented in Roland’s product manual). When we entered the preset number, we were then prompted to enter a name for the preset, and once entered we could select that preset in all of our scenes by name. This was so much easier than keeping lists on paper of patch numbers and names. 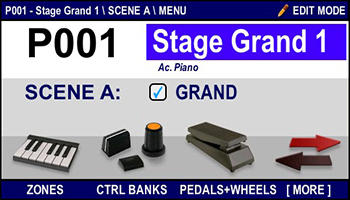 Entering details for controlling your MIDI gear is a walk in the park compared with other keyboards. To further test this, under the same performance, we then went to Scene B, and programmed preset 80 in bank PR-D of the XV-3080. We were happy to see that once programmed, this worked flawlessly, and pressing the Scene A button pulled up the right sound in the correct bank by name. Programming all the sliders, knobs., etc., was comparably easy: enter your MIDI CC message numbers and the knobs are assigned as you choose. Again, it would be great if you could download a template for a given sound module and have these fields pre-populated, but it was certainly easy enough to do (assuming you can live with the smartphone-like manner of text entry). What of the keyboard itself? The Fatar-made keybed had a nice, weighted feel. Of course, the feel of weighted keys is always going to be a matter of taste, and though we felt it was a little stiffer than we tend to favor, our Physis K4EX had a premium and expressive feel to it. Surprisingly, there is no computer/host-based editor with which to edit Performances, Scenes, and of course, entering patch names. For such a premium controller, it’s a serious omission, especially given the lack of external QWERTY keyboard support and the huge benefits offered by naming your devices and patches/presets. Overall, though, we were greatly impressed by the Physis K4EX as a MIDI controller keyboard. It really made easy work of controlling a wide range of external keyboards, sound modules, and soft-synths thanks to its great user interface and copious connectivity features. Obviously, when used as a MIDI controller, the sound is only as good as what you are connected to. However, the “EX” versions of the Physis keyboards also contain modeled sounds. In this day and age of cheap memory and storage, not to mention an overabundance of great sampled instrument libraries available, we were a bit surprised that Viscount chose to develop sound models instead of supplying a sample playback-based sound source. For now, the results are a mixed bag. Our review unit had 64 presets, each with four Scenes of different permutations. Most of the sounds fell into the “okay” category. As in, the could certainly get you through a gig without being embarrassing, but probably none would be your “go-to” sound in the studio if you had access to other sound sources (which is kind of why you’d want a Physis keyboard in the first place). The acoustic pianos sounded a bit thin to our ears, and the Rhodes pianos in the lower registers sound a little synthetic, though they were quite nice in the higher registers. The Yamaha CP emulation displayed similar sonic qualities—strong up top, weak down low. Certainly, playing live with a full band you certainly could pull off a gig using these sounds and nobody would be the wiser for it. The strings faired better, and some of the ensembles were particularly warm and spacious. There were also some nice sounds modeled after classic Oberheim and Roland synths that we enjoyed. The brass sounds were average, sounding a bit synthetic, though that’s not always a bad thing (especially if playing ‘80s pop songs). There were also guitar sounds, and while the acoustic bass sounds worked well, the electric guitar sounds didn’t much for us. We would have rather not had these selections at all and simply had more piano/synth sounds, or simply better piano sounds with fewer overall preset choices. As exemplified very well by Moddart’s Pianoteq virtual piano software, modeled piano sounds can be very good... but it took that company a few years worth of revisions to develop their piano modeling to the point where it could truly hold its own as an alternative to the big sampled piano products. 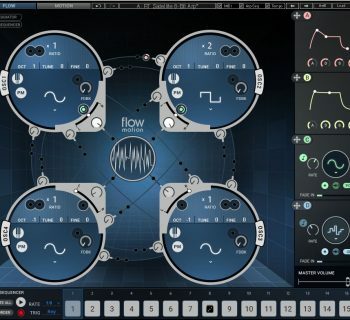 It felt like many of the Physis presets are just a generation or two away from really “nailing it,” so we’re hopeful that continued development further refines these sounds. The manual is available as a PDF file, and generally provided the information we needed succinctly. There are a few examples illustrating how to accomplish specific things, but we think more examples, either in the manual or even as online video clips, would be a good addition. You might make the argument that the typical person purchasing this extremely sophisticated MIDI controller knows all about MIDI system messages and how to get things communicating properly, but nobody wants to deal with such technical detail anymore—and Physis does a good job taking the engineering work out of using a controller. Still, a bit more hand holding in the manual would prove helpful. The website has no user community and only a few documents/tutorials. We think it would be cool if there was place on the Physis website where templates for MIDI devices could be posted and shared/downloaded between users, which would rapidly facilitate populating these controllers with proper keyboard names and patch names. The Physis K4 (88 keys) (MSRP $2,795) sells for $2,250 street. The Physis K4EX (MSRP $3,795) sells for $3,250 street. The Physis K5 (76 keys): (MSRP $2,595) sells for $1,950 street. The Physis K5EX: (MSRP $3,495) sells for $2,990 street. We reviewed the K4EX, which was in many ways an absolute monster of a controller, with a nice 88-key, fully weighted keyboard. However, the optional sounds don’t justify an additional $1,000 when judged on their sound quality. Taking away the -EX, the keyboards are still extremely pricey for MIDI controllers, despite their awesome user interface. We would love to see these hit the US market at lower prices, with much less of a difference in cost for the optional sounds. 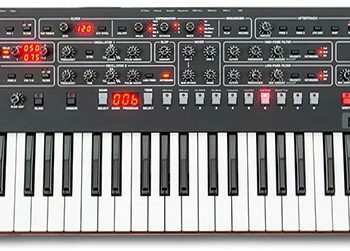 A 76-key version with synth action keys that weighs less and costs less would be another welcome addition to the product lineup. As MIDI controllers, these are the best you can get today (assuming you like the feel of their weighted keyboards), despite the sore absence of a computer-based editor. If you need to control a lot of MIDI sound sources in the studio or on the pro stage, as it stands today, nothing really compares to the Physis controllers. Any pro keyboard player could happily use one of these at the heart of their big rigs if the prices were more reasonable, but the optional sounds don’t add any value in our book—certainly not for the price. You already have better sounds in your collection, and the Physis keyboards will unlock easy access to all of your other gear. A few decades ago, we would have told you to check out something like the Roland A-80. In the last decade, CME might have made the list. But as it stands today, with seemingly hundreds of MIDI controller keyboards on the market, none of them have a feature set optimized for controlling your keyboards/sound modules without reliance on a host computer. Today, Physis stands alone. Fortunately, it's pretty awesome at what it does.